SNES Super Mario World 2: Yoshi's Island (USA v1.0) "game end glitch" in 02:36.81 by Masterjun. 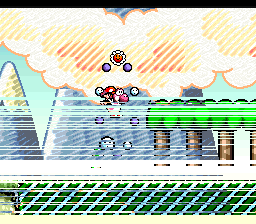 This is a quick completion of Super Mario World 2: Yoshi's Island. Here, the author, Masterjun, abuses a glitch that results in corruption of the egg list. This confuses the game and causes it to jump to the SNES CPU registers and start executing arbitrary code, which triggers the credits. There is also a run without game-breaking glitches and a 100% run. Exploiting this glitch instead of just using a warp glitch to get to 6-8 quickly saved over 3.5 minutes over the previous movie.